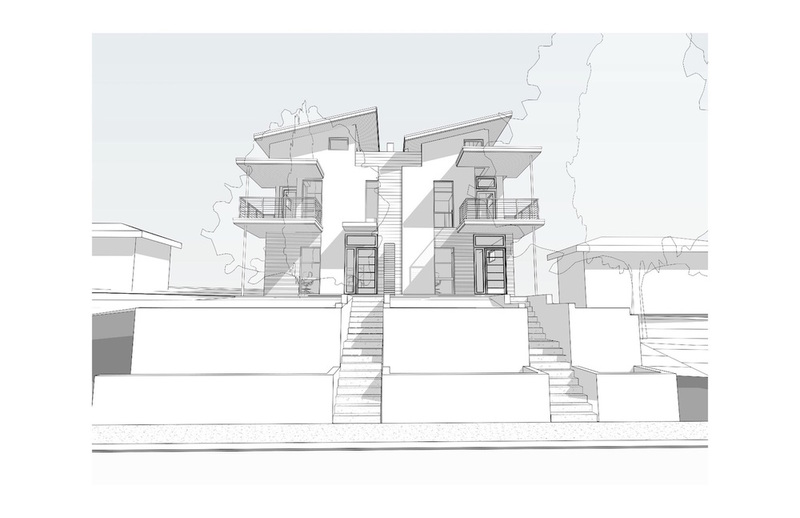 On the boards now at Cadence Design Studio…New modern duplex project in Englewood, Colorado, located near South Broadway shops and one of our favorite bakeries – the amazing French bakery Trompeau. It’s also not too far from one of our other projects further up the street - Maria Empanada ~ Empanada Artisans. With live venues like Herman’s Hideaway and the Gothic Theater nearby, this project caters to young professionals and couples who want to be near a hopping area but not pay the kind of rates seen in nearby Platt Park or LoDo. Both units will have about 2000 SF of living space with three bedrooms, a ground office, and four bathrooms. They will include lots of large windows for plenty of natural daylighting with a focus on an open layout on the main living spaces. Large second floor en-suite bedrooms with direct access to large outdoor balconies will provide great views of the foothills. The upper floor master bedrooms will also include vaulted ceilings that reach upwards of 17’ high! The main floors will include ample home offices for telecommuting and a clean open layout with high ceilings to create spaces with a loft-like feel. Two-car garages with room for storing all the outdoor toys we Coloradans enjoy and rear patios will round out the main levels. Stay tuned for blog posts on the progress of this project.